CodeRedTO is a volunteer-led transit advocacy group in the Greater Toronto and Hamilton Area (GTHA) founded on the principle of better decisions through better information. We provide documented facts about transit vehicles, modes, options, routes, and proposals, to assist GTHA residents in understanding and evaluating transit information, projects, and ideas. CodeRedTO is a collaborative group and all voices are welcome to participate in improving the quality of information available around transit. We believe that there are multiple modes of transit and multiple possible solutions and multiple sources of funding, and that all options should be considered rather than just one. We explicitly do not believe that light rail is always correct, nor that subways are always correct. We explicitly do not believe that public sector and private sector solutions are mutually exclusive, and we do not advocate for specific taxes but rather for rational discussion of capital and operations funding required to address the service needs of the region. We host and participate in public meetings and events to share information, and distribute information online and in person. We are available to present for any group or elected official wishing to include more data on transit-related topics in their event. Contact us any time! The lines shown below were fully funded (according to the completed 2010 Environmental Assessments) from the province ($8.4 billion (2010$)) and federal government ($350 million). 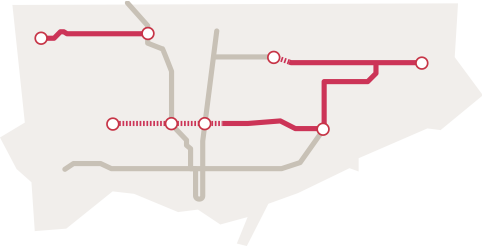 Instead of building three rapid transit lines in Toronto’s suburbs, Mayor Ford negotiated with the province to bury the Eglinton-Crosstown line for its entire length, leaving Finch West, Sheppard East, and Malvern with no rapid transit. 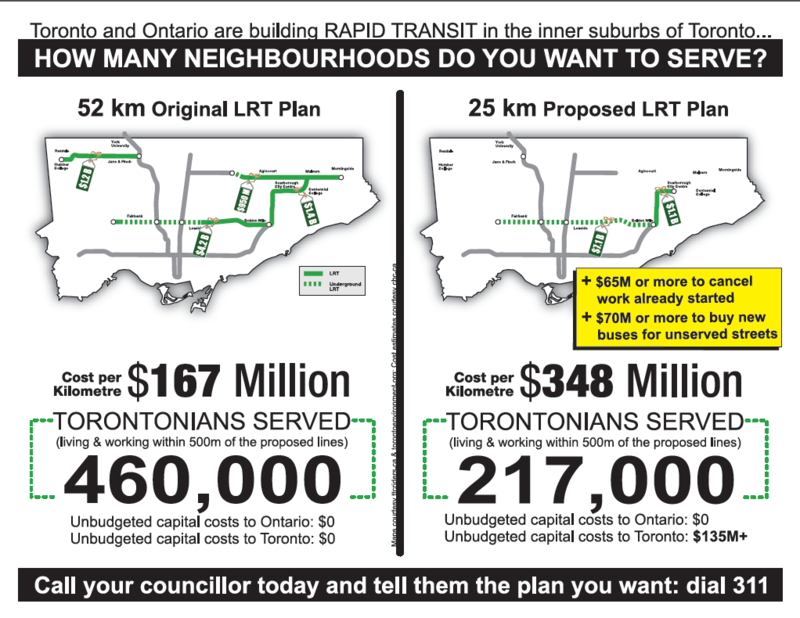 This negotiation included Toronto paying massive cancellation fees, as work on Transit City was already underway. The province estimated that cancelling Transit City would cost the city at least $65 million. Added onto that another $70 million to buy new buses for Finch and Sheppard, as they would soon be over capacity with no new light rail to relieve the congestion. Since then, CodeRedTO has continued to hold public meetings, meet with the TTC, the Premier, the Minister of Transportation, and many councillors to ask about their transit concerns, and to work with partners within the Move The GTHA collective and other groups to improve the quality and accuracy of transit discussions in the GTHA, and to support existing planned & approved projects. CodeRedTO also makes members available to work with agencies on projects such as the Scarborough Subway Extension Stakeholder Advisory Group, the Relief Line Stakeholder Advisory Group, and others. CodeRedTO is available for media questions as well, speaking as advocates for more and improved transit across our region. LEARN about Transit and why there's room for subways, light rail, and streetcars in our region, and how light rail is actually a great city-building choice for the lower-density neighbourhoods in Etobicoke, Scarborough, North York, Mississauga, Brampton, Hamilton, and Kitchener-Waterloo. 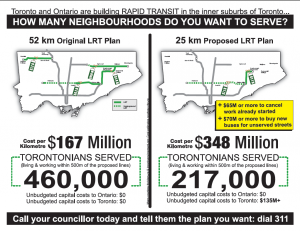 CALL your City Councillor, and tell them that you want rational, affordable, and rapid transit in Toronto to benefit everyone, not just one small section of the city. Rapid transit to Malvern, Morningside, Jane & Finch are achievable if we learn from successful transit networks around the world. TELL your friends and family that subways are amazing - they really are! - but with limited funding we have to make rational decisions about whether to support more residents or leave people waiting for crowded buses for decades longer. Did you know: The bus routes on Finch have over 85% of the ridership of the (much shorter) Sheppard Subway, and the bus routes on Eglinton already have over 140%! The lengths differ but the need is common in many areas of the city. We are decades behind and need better transit options for our residents now, not just small extensions that use up all the budget.